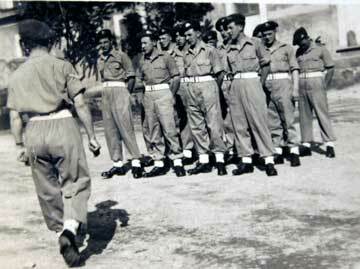 1st Battalion King's Own officers at San Remo, 1944. 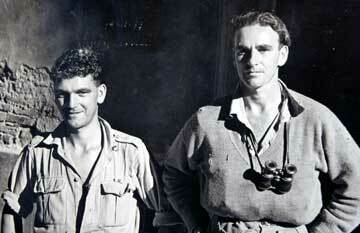 Left Major Prideaux (Kent Yeomanry) and right Lieutenant Colonel Richard Anderson, Commanding Officer, 1st Battalion, 1944. 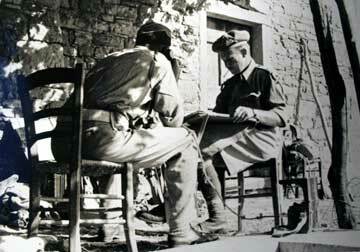 Tactical Headquarters of the 1st Battalion in the Tiber Valley, Italy, 1944. The driver of the first vehicle is Private Fitzgerlad and behind him is the Commanding Officer, Lieutenant Colonel Bunbury, who replaced Anderson following his promotion. The adjutant sat to his left is Captain Brigden. 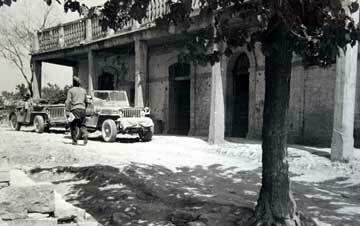 1st Battalion Headquarters on the Adriatic Front, Italy, 1944. 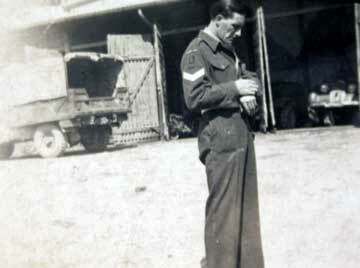 Sergeant Philip Fordham, signals sergeant of the 1st King's Own, Italy, 1944. Fordham was awarded the Distinguished Conduct Medal for maintaining line communications during the action at Pideura between 7th and 13th December 1944. 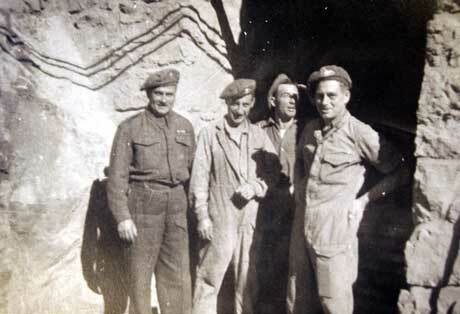 Lance Corporal Jones, Private Jack Stapleton (who later died of wounds on 16th December 1944), Private George Simmons and Private Tilling, of the 1st King's Own possibly in Rome, 1944. George Simmons, from London, had joined the King's Own from the Royal Fusiliers in Italy. After the war he left the army and settled in Lancaster, he became a well known figure as an insurance agent. 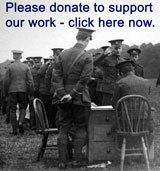 George was for many years secretary of the Lancaster Branch of the regimental association. He died in 2006. 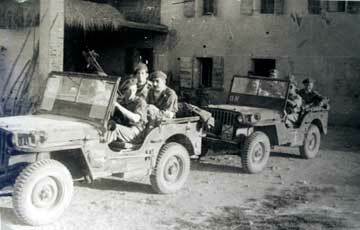 Two of the 1st Battalion who were involved in the action at Montone in July 1944. Pideura Church, where C Company of the 1st Battalion, held off a German attack and inflicted 300 casualties. December 1944. 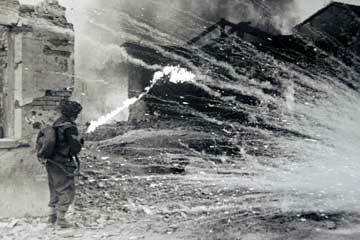 A flame thrower in action and the belated burst of a phosphorous bomb. 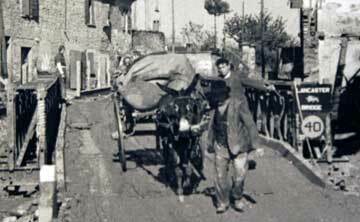 Rimini area, Italy, 1944. 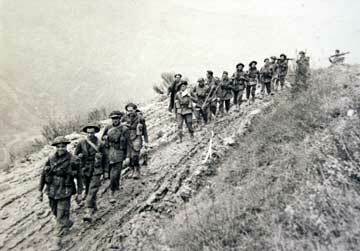 B Company, 1st King's Own, are coming out of action on 20th December 1944 at Pideura Ridge, Italy. 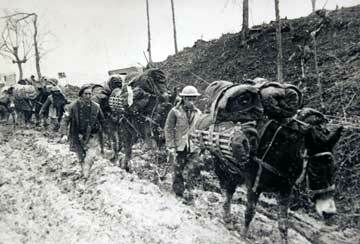 1st Battalion receiving supplies by mule under Colour Sergeant Lycett. Pideura Ridge, Italy, December 1944. 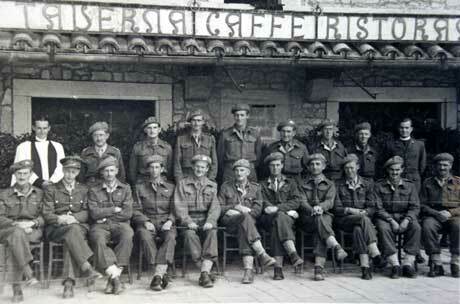 1st Battalion in Italy, sometime in 1944. 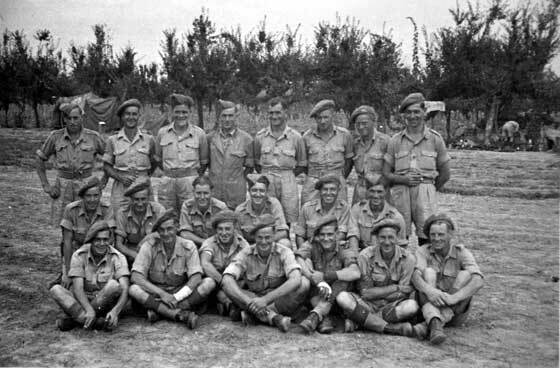 Members of Pioneer Platoon, 1st Battalion, King's Own Royal Regiment, Italy, 1944. 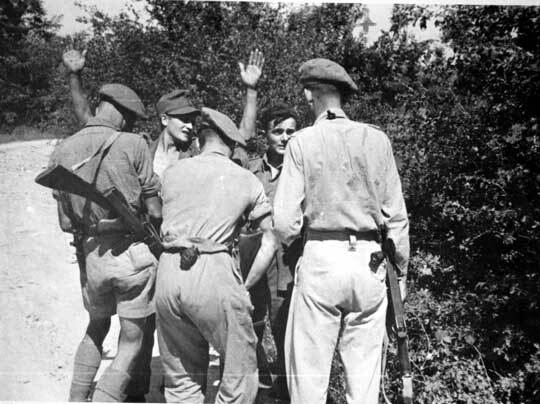 Three soldiers of the 1st Battalion King’s Own Royal Regiment in Italy in 1944 or 1945 with two German soldiers as prisoner. Probably summer 1944 by the dress of the soldiers, one is in shorts, the other has a hand grenade clipped to the rear of his belt. One German has his hands held high. From the collection of Private Thomas Whalley, number 3716101, Support Company, Carriers, 1st Battalion, King’s Own Royal Regiment. 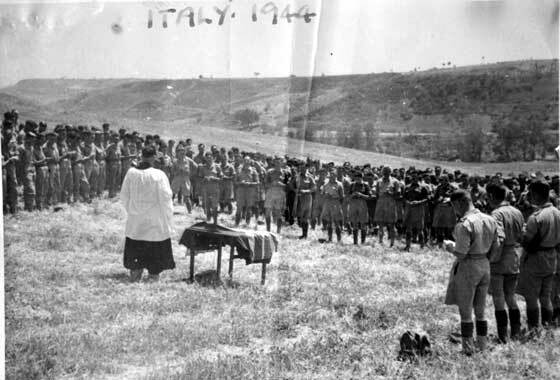 Field Service by Padre of the 1st Battalion, King’s Own Royal Regiment in Italy in 1944. The padre is next to a table covered with union flag, the officers are lined up in the centre surround by the other ranks formed up in a square. 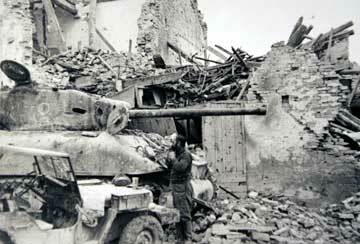 The image is marked ‘Italy 1944’. From the collection of Private Thomas Whalley, number 3716101, Support Company, Carriers, 1st Battalion, King’s Own Royal Regiment. 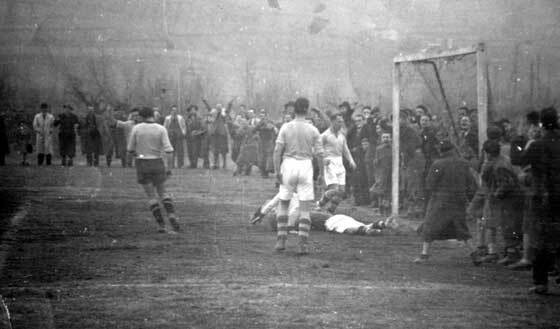 King’s Own playing an Italian football team, marked as at Citta de Castella. Photograph is dark and dress of the spectators indicates that it must be winter, 1944 or 1945. From the collection of Private Thomas Whalley, number 3716101, Support Company, Carriers, 1st Battalion, King’s Own Royal Regiment. 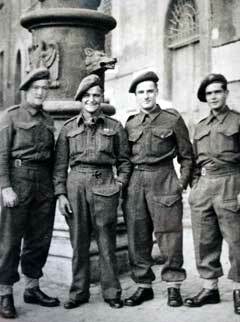 Four members of the 1st Battalion, King's Own Royal Regiment, outside Mussolini's hideout, somewhere in Italy, 1944. Second from the left is Private William Edward Sellars, number 14594494, of the Pioneer Platoon, of Headquarter Company, 1st Battalion, King's Own. 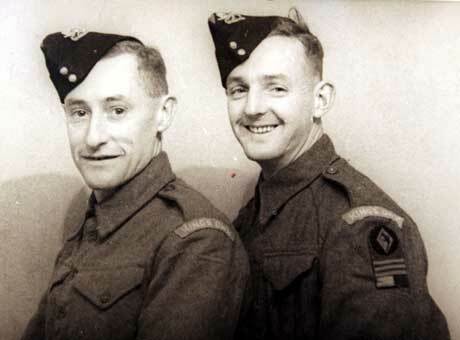 Left is Private William Edward Sellars, number 14594494, of the Pioneer Platoon, of Headquarter Company, 1st Battalion, King's Own, the soldier on the right is unknown. 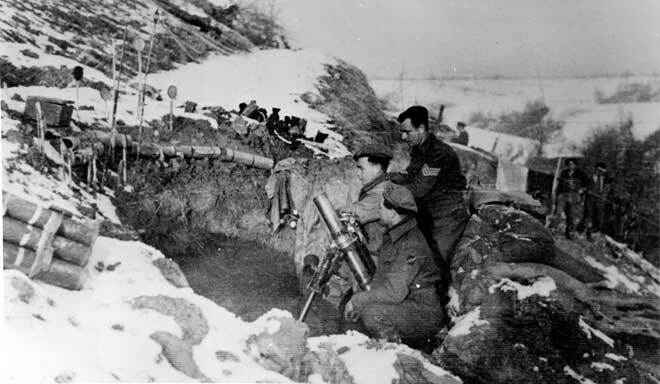 3 Inch mortar position of the 1st Battalion, on the Senio Front, Northern Italy, January 1945. 'Lancaster Bridge' at San Carlo, Northern Italy, captured by the 1st Battalion, 1945. 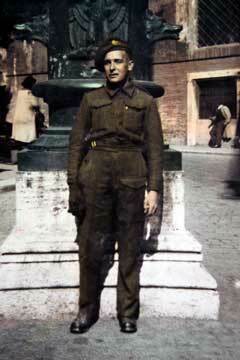 Private Richard Thomas Hasler of the 1st Battalion King's Own in Italy, 1945. 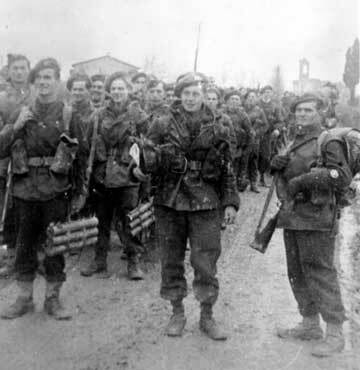 Men of the 1st Battalion in Northern Italy, 1945. 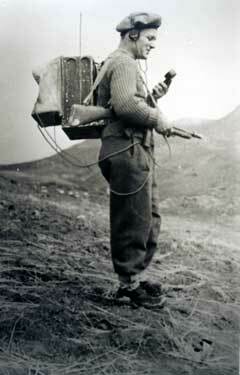 Corporal Richard Thomas Hasler of the 1st Battalion, in 1945, probably after the war was over. 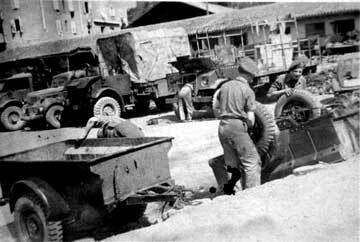 Motor Transport compound of the 1st Battalion, King's Own, northern Italy, in 1945, probably after the war was over. 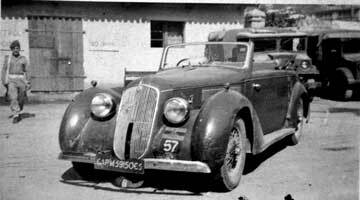 Staff Car used by the 1st Battalion, King's Own, northern Italy, in 1945, probably after the war was over.